This article is about illustrious person in Jainism. 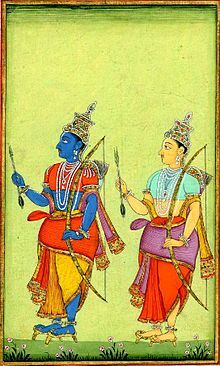 For Hindu deity, see Balarama. In Jainism, Balabhadra or Baladeva are among the sixty-three illustrious beings called śalākāpuruṣas that are said to grace every half cycle of time. According to Jain cosmology, śalākāpuruṣa are born on this earth in every Dukhama-sukhamā ara. They comprise twenty-four tīrthaṅkaras, twelve chakravartins, nine balabhadra, nine narayana, and nine pratinarayana. Their life stories are said to be most inspiring. According to the Jain puranas, the Balabhadras lead an ideal Jain life. ^ Jain, Jagdish Chandra; Bhattacharyya, Narendra Nath (1 January 1994). Jainism and Prakrit in Ancient and Medieval India. p. 146. ISBN 9788173040511. This page was last edited on 4 May 2017, at 12:56 (UTC).